For other uses, see Terrier (disambiguation). Some Terrier breeds. The book of dogs; an intimate study of mankind's best friend, 1919. A terrier is a dog of any one of many breeds or landraces of the terrier type, which are typically small, wiry and fearless. Terrier breeds vary greatly in size from just 1 kg (2 lb) to over 32 kg (70 lb) and are usually categorized by size or function. There are five different groups, with each group having several different breeds. Most terrier breeds were refined from the older purpose-bred dogs. The gameness of the early hunting terriers was exploited by using them in sporting contests. Initially, terriers competed in events such as clearing a pit of rats. The dog that was fastest in killing all the rats won. In the eighteenth century some terriers were crossed with hounds to improve their hunting, and some with fighting dog breeds to "intensify tenacity and increase courage". Some of the crosses with fighting dogs, Bull and Terrier crosses, were used in the blood sport of dog-fighting. Modern pet breeds such as the Miniature Bull Terrier are listed by the Fédération Cynologique Internationale (FCI) under Bull type terriers. Today, most terriers are kept as companion dogs and family pets. They are generally loyal and affectionate to their owners but can be "big characters". Based on a 2006 study, genetic analysis indicates that most terriers fall in the "modern/hunting" cluster of dog breeds developed from the same pool of ancestors in Europe in the 19th century. A few terriers are found in the "mastiff" cluster with Pomeranians, Labrador Retrievers, and other large-headed dogs, and the Tibetan Terrier is found in the older grouping of Asian and African dogs, along with the Pekingese. In the eighteenth century in Britain, only two types of terriers were recognized, long- and short-legged. Today, terriers are often informally categorized by size or by function. Hunting-types are still used to find, track, or trail quarry, especially underground, and sometimes to bolt the quarry. Modern examples include the Jack Russell Terrier, Rat Terrier and the Patterdale Terrier. There are also the short-legged terriers such as the Cairn Terrier, Scottish Terrier, and West Highland White Terrier which were also used to kill small vermin. The original hunting terriers include the fell terrier—breeds developed in northern England to assist in the killing of foxes—and the hunt terrier—breeds developed in southern England to locate, kill or bolt foxes during a traditional mounted fox hunt. 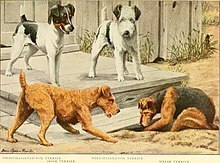 The various combinations of bulldog and terrier that were used for bull-baiting and dog-fighting in the late nineteenth century, were later refined into separate breeds that combined both terrier and bulldog qualities. Except for the Boston Terrier, they are generally included in kennel clubs' Terrier Group. Breeders have bred modern bull-type terrier breeds, such as the Bull Terrier and Staffordshire Bull Terrier, into suitable family dogs and show terriers. Toy terriers have been bred from larger terriers and are shown in the Toy or Companion group. Included among these breeds are the English Toy Terrier and the Yorkshire Terrier. While small, they retain true terrier character and are not submissive "lap dogs". Other descendants of the bull and terrier types, such as the Asian Gull Terrier, are among the dogs still raised for illegal dog-fighting. Terriers range greatly in appearance from very small, light bodied, smooth coated dogs such as the English Toy Terrier (Black and Tan), which weighs as little as 2.7 kg (6 lb), to the very large rough coated Airedale Terriers, which can be up to 32 kg (70 lb) or more. As of 2004, the United Kennel Club recognized a new hairless breed of terrier derived from the Rat Terrier called the American Hairless Terrier. ^ Marvin, John T. (1982). "2. Background and Heritage of the Terrier Family". The New Complete Scottish Terriers (Second ed.). New York: Howell Book House Inc. p. 20. ISBN 978-0-87605-306-5. ^ The Fédération Cynologique Internationale. "FCI Breeds nomenclature". www.fci.be. Archived from the original on 2012-11-26. Retrieved 2008-03-28. ^ Ostrander, Elaine T. (September–October 2007). "Genetics and the Shape of Dogs: Studying the new sequence of the canine genome shows how tiny genetic changes can create enormous variation within a single species". American Scientist (online). 95 (5): 2, 4. doi:10.1511/2007.67.3724. ^ Dandie Dinmont Terrier Club of America. "History of the Dandie Dinmont". DDTCA. Retrieved 2008-03-28. Wikimedia Commons has media related to Terriers. This page was last edited on 14 April 2019, at 05:27 (UTC).